There are few aromas better than the aroma of an already prepared meal after a long day. I love using my crockpot and I use it a lot when I know I’m going to have a busy day. This is one of our favorite slow cooked meals and I think it will soon become your favorite, too. We love the flavors of Italian food, but pasta is full of carbs and will send your blood sugar sky high. This meal gives us the flavors of Italian food, but without the unhealthy carbs. These zucchini ribbons are by far a healthier choice than spaghetti noodles, or as I like to call spaghetti: sugar on a string. I think you’ll like the subtle flavor and texture the zucchini noodles add to the dish, too. This dish is even better the next day so be sure to make extra! Coat your slow cooker with olive oil. Place fresh or frozen chicken breasts on top of the oil. Add, salt, pepper, dried herbs, and garlic over the breasts. (If you are using fresh herbs, wait to add them in during the last hour of cooking.) Add in diced tomatoes then onions. Pour balsamic vinegar over the mixture. During the last hour of cooking, add in frozen spinach and if you are using fresh herbs, add them in now, too. Cook on low 6-8 hours (don’t worry if it goes over 8 hours – crockpots are so forgiving) or high 4 hours. To make the zucchini ribbons: Using a vegetable peeler, peel the zucchini over a colander. Stop peeling when you start seeing the seeds. Pat or press as much water as you can out of the zucchini. Saute in olive oil or fat of choice for a few minutes or until desired doneness. 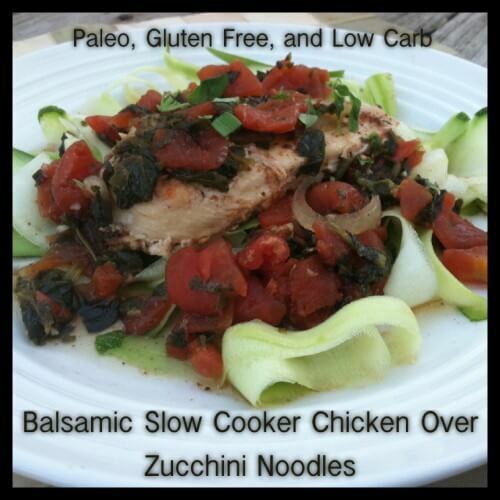 Place the zucchini ribbons on a plate and top with the balsamic chicken. Add parmesan cheese if you eat dairy or more fresh basil. Enjoy! This looks great. I am always looking for new recipes for my crockpot and this looks like a really good one. I am going to try it this week. I really like the idea of the healthy zucchini noodles, too. Thanks, Melanie! Let me know how you like it after you make it! I threw everything in the crockpot this morning and just had the most wonderful meal using this recipe. Thank you for sharing. Everyone loved it and it will now go in my rotation. I even got the hubby on board with the zucchini noodles. Delicous! I made this over the weekend and it was fabulous! It’s my new favorite crockpot recipe! Thank you so much for sharing. Our new favorite crockpot dinner! We love this. I’ve made it twice so far and love the new way to eat spaghetti! Made this last night and can’t wait to eat it again for lunch. Excellent flavor. I love how quick and tasty this meal is. Thanks for posting. I made this the other day and it was wonderful! I added a bit more spinach (I can never get enough! )and it was so tasty. Love crockpot recipes this time of year. I hate heating up the whole kitchen and adore recipes that make plenty of leftovers. Lovely lunch for the rest of the week! I was really looking forward to this meal. Incredibly easy to make. I left the slow cooker on for 7 hours (halfway between the 6 hour and 8 hour mark as suggested) but this ended up in very dry chicken breasts. I have read that chicken breasts should be cooked no more than 5 hours as they have a tendency to dry out. I will this recommendation because I think this recipe can be a real winner!